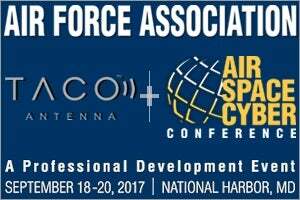 TACO is pleased to be exhibiting at The Air Force Association’s 2017 Air, Space & Cyber Conference in National Harbor, Maryland, US. This year’s theme is ‘Breaking Barriers: Heritage to Horizons’. It is the nation’s premier event for defence and aerospace professionals worldwide. AFA brings together US Air Force senior leaders, including the Secretary of the Air Force, the Chief of Staff of the Air Force, Major Command Commanders, the Chief Master Sergeant of the Air Force, and many more. For more information, please contact TACO or visit booth 120 at the Air, Space & Cyber Conference between 18 and 20 September.